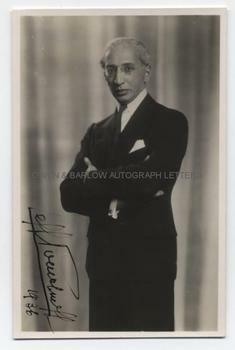 Post-Card Photograph Signed, "Leff Pouishnoff. 1936". Approx 5.5 x 3.5 inches (14 x 9 cms). In fine condition. Leff Pouishnoff studied at the St Petersbury Conservatory under the tutorship of Rimsky-Korsakov and was described as the most brilliant pupil of his generation. After the Russian Revolution he made his home in London where he developed an international career as a concert pianist, specialising in the works of Chopin. His piano technique was marked by a delicacy and sensitivity that won high praise from critics. Leff Pouishnoff took his own life in 1959.